My girlfriend and I own a lot of card games. When we first got into gaming we started out with card games. Without knowing if we were going to like the hobby or not they seemed like a safe investment, rarely costing more than £20. We did, and now we own hundreds of the blighters. They are freaking everywhere, breeding like Gremlins. We can’t get them wet or feed them after midnight, else they will turn evil. It’s a real dilemma. A few weeks ago I (past-Luke) wrote a note saying: “Write about your top 5 card games”. Now I hate past-Luke a little bit because it seemed like such an easy task back then. In the past few weeks the collection has blossomed into a whole library of its own, and now I have no idea. Number one on our list, by which I mean the top most listed one and not the actual number one (as this is not an enumerated list), has to be Sushi Go. 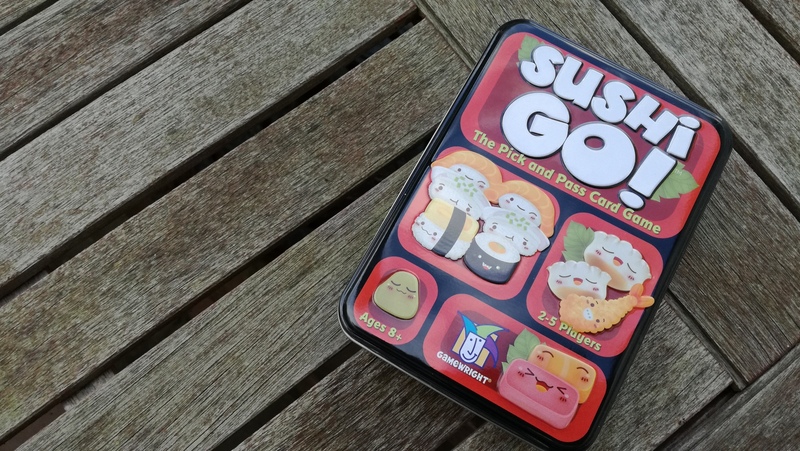 Sushi Go is, at its core, a card drafting game, where the only mechanic is drafting cards and passing them around. The idea, I believe, is to recreate a Sushi restaurant experience, as each player takes the dish that most appeals to them as it passes by. That card is then revealed to everyone, the hands get passed onto the next person, and the whole process is repeated. The idea is to collect sets. For instance, two Tempura Prawns are worth 5 points. Three Sashimi are worth 10 points. 6 points go to the person with the most Maki Rolls. The game takes place over three courses, with points being counted at the end of each course, bar Puddings, which are counted at the end of the game. What makes Sushi Go is two-fold. Firstly, it is quick to play, with each game taking around 20-30 minutes. This makes it the perfect sorbet game. Secondly, it has adorable artwork that makes everyone smile. Sushi Go is the ultimate “happy” game. Fluxx occasionally gets a bad name online. There are a few people who hate it and its many iterations for a couple of reasons. It can seem like a cash cow at points, with so many versions that are, in all honesty, not overly needed. Also, it appears to have no strategy to it. I say nay, be gone with you naysayers! Fluxx is an amazing game, with a lot of versatility, and so I am a huge advocate of the Fluxx games. The concept? The rules fluctuate, hence the name. The whole game exists in a chaotic state of flux, with players changing the rules on a turn by turn basis. Starting with pick a card, play a card, this can quickly change to pick up five cards and play all but one. I own a few versions of the Fluxx game – Cthulhu was the second card game I ever bought. Swiftly after I purchased Star Fluxx, Pirate Fluxx, and (more recently) Firefly Fluxx. I even once had the honour of meeting Andy Looney (the creator of Fluxx) himself at the UKGE in 2015. He was showcasing Batman Fluxx, and afterwards he signed an Andy Looney special card which I have in a frame. Anyway, out of all the Fluxx’s, Star Fluxx is the best I have played – why? Because unlike the specific properties, Star Fluxx has so many references to Sci-Fi that it is just as fun to try and guess what the references are as it is playing the game. It adds a whole new level to the game and the humour…the humour is second to none. Subtle and dry, but so effective. So Star Fluxx is great fun. Do you need a thousand versions of Fluxx (or even four like I do)? No. You don’t; however, in my opinion, everyone does need one copy of Fluxx. 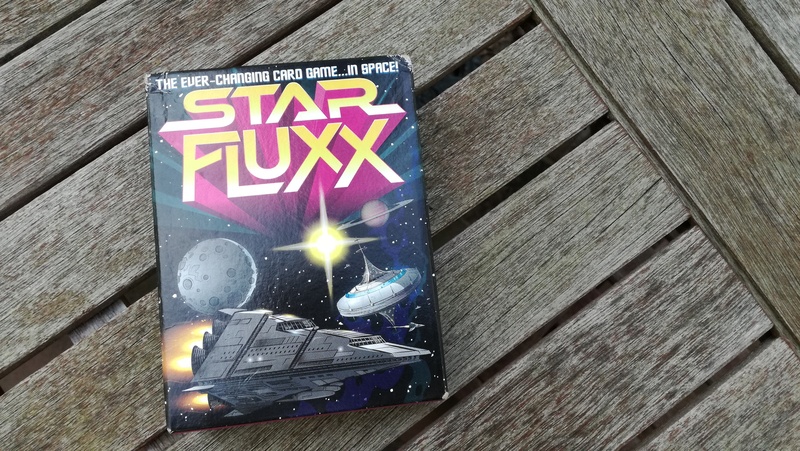 If you are going to buy one copy, then I would recommend you make it a copy of Star Fluxx. I’m actually writing a review of Brutal Kingdom tomorrow, so I won’t go into too much about what Brutal Kingdom is about. Just read the review tomorrow. Yes, this is cheating; however, it is also my blog, my rules. Alright, fine, I won’t count this one. Gloom is the most delightful game about making everyone depressed there could possibly be and we have had a lot of fun hours with friends playing it. In Gloom, you play one of a number of mismatched families, looking to kill your family members off. In the game, you play cards on both your, and your rival’s, family members in order to rack up either positive or negative points before killing them off. The twist? You want the negative points, whereas you want your rivals to have the positive points and live long/happy lives. Where Gloom is really special though is in the storytelling aspect of the game. Something doesn’t just happen – it needs to be explained, and so the life stories of the families play out over the course of an incredibly hilarious evening. If C &K are reading this (you know who you are!) three words: Logan and Logina! Yes, we even have long standing inside jokes relating to Gloom with friends! 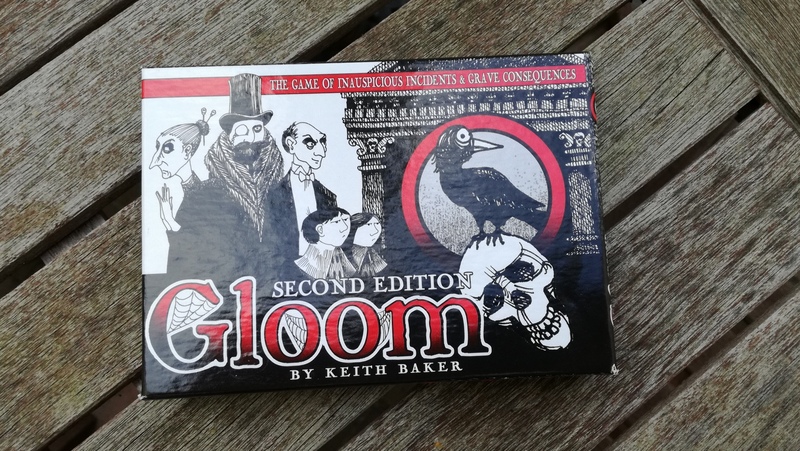 We have had some incredibly fun evenings playing Gloom, and I am sure we will have plenty more in the future. For that it had to be on this list! 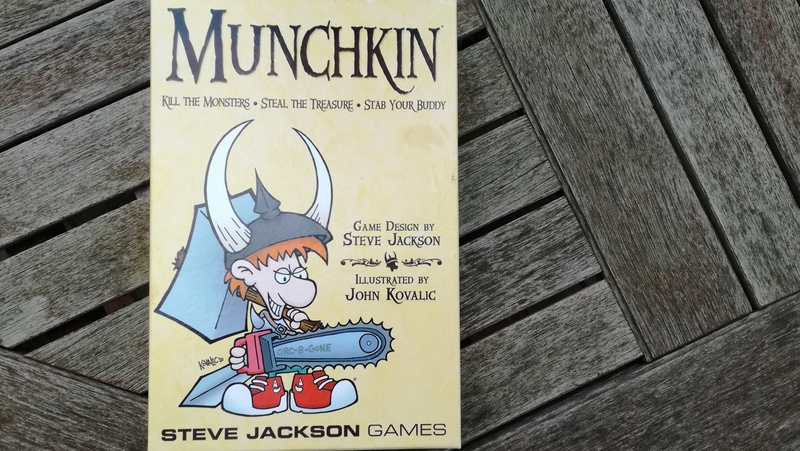 Described as “D&D without the fuss” (by me) Munchkin is a game that graces the shelves of many a gamer. In it, the players play adventurers competing to get to 10th level by fighting monsters, gathering loot, and fighting each other. Munchkin always has a fond place in my heart because it was my gateway game. It was the first game I played that really got me addicted to gaming, and I still remember the night I played it for the first time (said he, making it sound like a love affair). We played Adventure Time Munchkin with a mate, and had such an amazing time playing that we decided to purchase the base game almost directly afterwards. Now we have three versions of the game. So what is it that makes Munchkin truly special? The answer is simple. It all comes down to the core mechanics of the game. Munchkin is semi-coop. What this means is the players are playing each other, but also trying to work with each other at certain points. This makes for a large amount of debate, joking around, and general hilarity. Guillotine is a game about the French Revolution and cutting off the heads of nobles. It is an incredibly simple game, with little more to it than arranging and rearranging a line to reposition who the first noble is. The player must always take that noble for their score pile. That’s how it is played. Nobles are worth certain amounts of scores and have special abilities when you pick them up (or rather darkly, pick their heads up) and it is the player with the highest score in the end who wins. Guillotine is an incredibly simple game that has our house divided. My girlfriend loves it and as do a few other people I know. I, on the other hand, have a love/hate relationship with Guillotine. Sometimes it is a bit too simplistic for my taste, but that can also be its strongest benefit as well. It is still a fantastic game. What makes Guillotine, in my eyes, is the artwork. At its heart, there is nothing revolutionary about the mechanics; however, the art is delightful and makes it a really fun game to play. Each turn the player can play action cards, and each card is illustrated in a superb way. 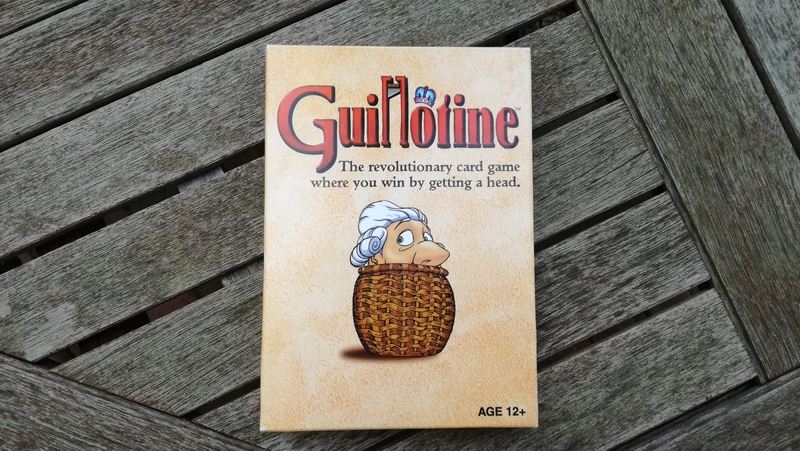 Guillotine seamlessly merges simple gameplay with neat artwork and that is always fun going back to. That is the reason we find ourselves playing it over and over again. It was tough deciding on five (ahem, six) and there are so many that didn’t make the list. Port Royal, Murder of Crows, and Oddball Aeronauts were all names that almost made it but didn’t quite. I guess they’ll have to be on the next one. So what about you? What are your top five? Let us know in the comments below. I’ve heard of Fluxx but really don’t know anything about it. I’d love to see a proper review sometime if you’re up to it.